It was love at first sight, the first time Ursie was introduced to the Megasus Horserunners. 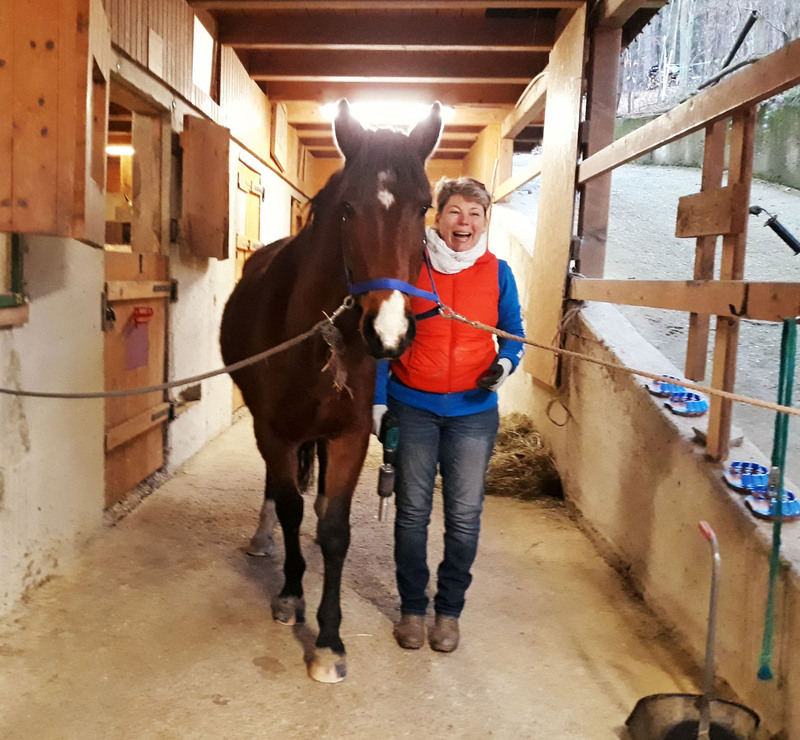 As a task force member since the very beginning, Ursie has tested the Horserunners thoroughly and she has implemented them in her work as a hoof trimmer. Not only that, Ursie, being a complete Megasus nerd, has been employed in our for Research and Development Department since Spring 2017. Today we are going to go behind the scenes with Ursie. Dearest Ursie, you’ve worked with horses your whole life. Tell us again, why you specialized in hooves and what you do in the Megasus’s Research and Development Department. In 1996, I removed the last pair of iron shoes from my then Class S dressage horse because he developed Navicular Syndrome. Since then, I never shod another horse in my stall. I come from a family of riders and we’ve always had horses with grave hoof problems. 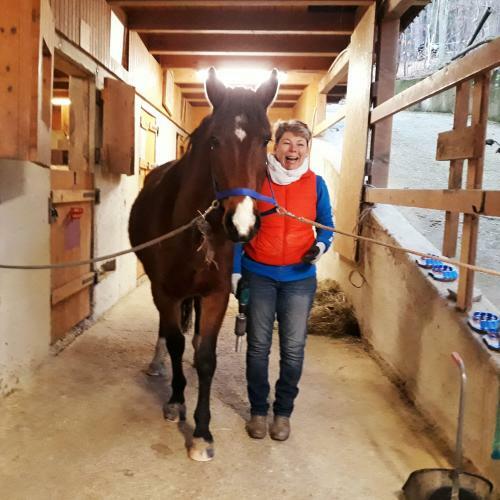 Because nailed on hoof protection never came into question again, my search for alternative solutions began and ever since, I’ve been fascinated about learning more about the horse’s hooves. At Megasus, I can live out this dream! I love experimenting and I like to bring my own ideas to the table. It was always like that: In our stable, there was never standstill and we never stopped trying to better the conditions for our horses. In our Megasus outdoor laboratory, which also includes a demanding trail, my daughter and I test different materials and glue. We conduct really intensive tests. In addition, I often take part in the Megasus filming days and I am part of the Mega-Tour, where I get to mount the Megasus with Charly and my daughter Nina. Just in the past few months, we have customized and mounted around 200 Horserunners. It’s been so much fun! Can you remember the first time you heard about the Megasus? Naturally! I could never forget it; I was hooked from the very beginning! I was invited by a friend to the first presentation and introduction of the concept by Louisa and Charly. I was inspired and without a doubt, I wanted to take part in the revolution! I am forever grateful that I could follow its progress and development from the first 3D print. Since then, I have been completely convinced about this innovative hoof product and am glad that I attended that very first presentation. You have already tried out many different varieties. What makes for a good hoof protection product in your opinion? First off, we want our horses to be able to run over different types of ground or participate in sporting activities comfortably bare hoof. However, the reality looks very different. Many horses need, at times, some sort of hoof protection. A horse should be able to run about pain-free, that’s the highest priority. 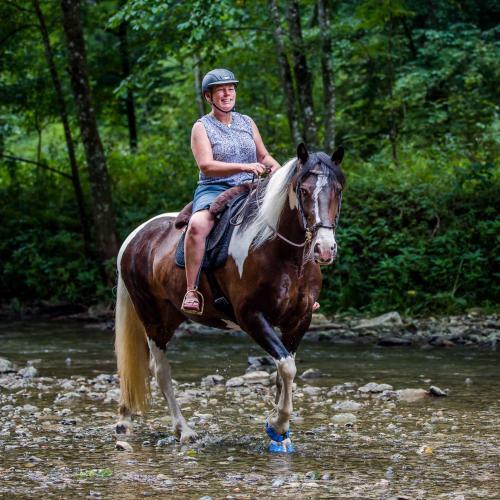 Right now, horses transitioning from iron to bare hoof, whether because health reasons or being exposed to extreme stress, need protection and support. Good hoof protection should be quick and easy to mount on the horse’s hooves, provide stability and at the same time, offer flexibility which allows for natural hoof movement. The most important things in a hoof protection for me are that the horse can move about and run comfortably and that it can be adapted to the individual needs of both the horse and the rider. I do not want to be limited in my work as a hoof trimmer. I want to be able to provide the best solution for the horse and with the Megasus Horserunners, I can be flexible and for long term protection, next to the Mega-Mega-LOCK-System , I can offer one of Megasus’s permanent fastening alternatives. For years, you’ve worked with horse hooves and have a lot of experience with gluing. What was your first impression of the Mega-Glue System? Oh yes! I love gluing – as you know. It’s simply a genius solution if you need long term protection. From the first time that I held the Megasus Horserunners in my hands, I was a little sceptical about whether using so little glue was really possible. After the first mounting and some extensive testing on my own horse, my doubts were cleared. The greatest benefit of the Megasus Horserunners is their individually customizable and very stable Fastening System. It’s one of the main things that differentiates them from other products on the market. When you think back to the first time you mounted the Mega-Glue System, what was your first impression? The adaption, cutting and fastening of the Side-Clips work the same as for both the Mega-LOCK and Mega-STICK systems and with a bit of practice, it’s not a problem. The glue itself is fun because all you have to do is put a small amount of glue behind the Side-clips, press down and you’re done. It is really clean, quick work and provides remarkable hold and visible results. It doesn’t just make me happy, but my customers are also very pleased! And you can do it all without needing to sand away the unnecessary hardened glue at the end. The Side-Clips were designed so there is adequate space for the required glue thickness. I was simply thrilled by the ease. For the first time, I could glue on a hoof protection without needing to also apply glue to the sole of the hoof and the whole process can be done calmly – because the horse can stand on all four hooves throughout the whole thing. For horses with pain, this is a blessing. It’s important to me that the horse’s soles remain glue free because, for the horse, glue in-between the sole and the hoof protection feels almost like having a rock stuck in the shoe. You know so many different horse/rider pairs. 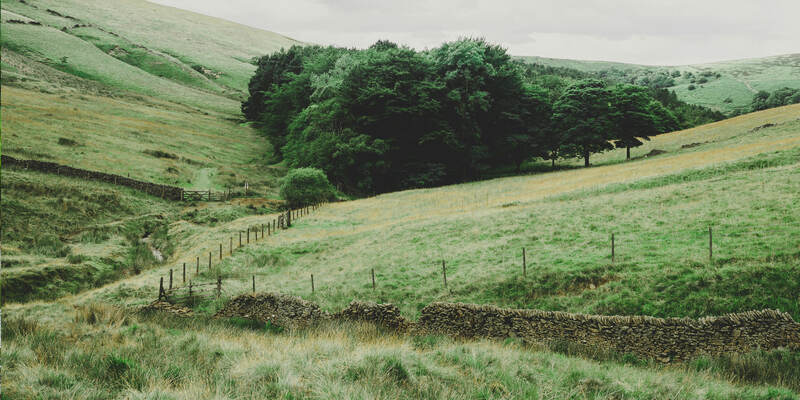 How could other horse owners benefit from this system? In comparison with other gluing systems, handling is easy and simple. In my opinion, many horse owners can learn to do it themselves quickly on their own horses and without complications. I swear to you, it’s absolutely a fantastic feeling not to worry about your hoof protection and to know that your horse’s hooves will be well protected and healing until the next trim cycle. You said before that your own horse has tested the Megasus Horserunners. What was your experience as a rider? Our horses are pioneers and need to try everything. 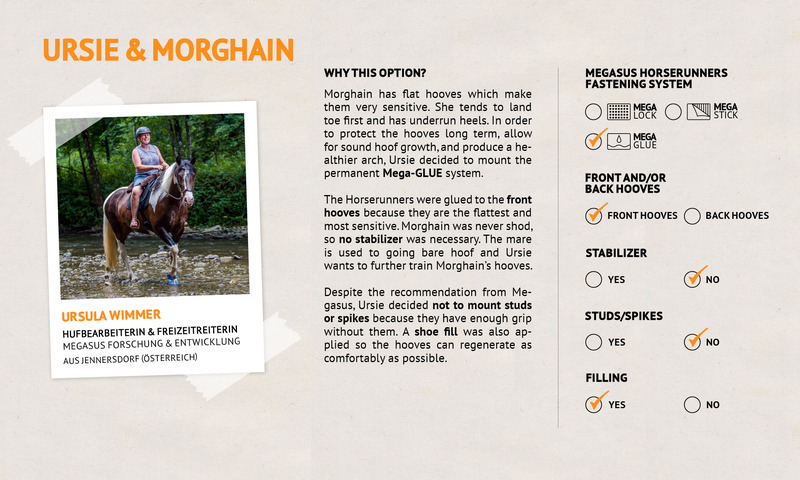 My lovely mare, Morghain, is really sensitive. She has flat hooves, she tends to land on her toes as soon as something is amiss, and she has underrun heels. In the last several months her thin soles made movement difficult. We mounted the Mega-Glue System for 3-4 week periods and filled them with a special silicone. Since then, her hooves have regenerated very quickly. She has no problem doing her riding lessons, with or without protection. What would your lovely horse Morghain say? She absolutely loves her Megasus Horserunners, but when the soles are also filled, she can hardly stop moving. She would say it’s like ‘walking on clouds’ and that she can really go full out, without worrying about the ground. With just a few steps, she was able to trust her Megasus Horserunners despite her uncomfortable hooves. Her gait pattern is changing step by step. With the Megasus on, she moves as if her hoofs have no problems at all. Regardless of the riding arena or a quick ride off-road, we enjoy it, they give us a feeling of security. My mare has had so much fun galloping since! Thank you very much Ursie, and we wish you and your Morghain many fun rides together! 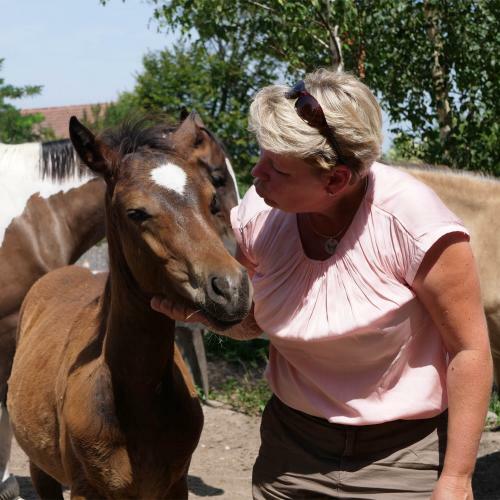 We are proud to have you and your horses on our team!